The following post is a sample of my weekly Quick Tip email. 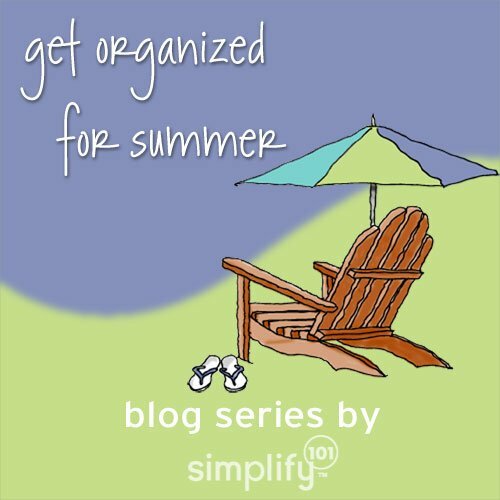 Since it goes along with getting organized for the summer, I wanted to include it as part of the Get Organized for the Summer blog series. By the way, if you don’t yet subscribe to my Quick Tip, you can sign up here. In our house, summer is just around the corner — there are only 9 school days left! (But who’s counting, right?) While summer is a fun and carefree time of year, it can also mean the end of the routines. This makes it easy for clutter to start creeping back in. If you’re like me, you don’t want your house to fall apart over the summer and have three months of clutter to deal with when the kids head back to school. Plus, if you’ve been making progress on getting your house in order since January, the last thing you want to do is lose momentum or backslide over the summer. 1) Keep organizing on your radar screen. Commit to spending 15 minutes a day keeping the house in order or making progress on an organizing project. Once a day, set the timer for 15 minutes and put things back where they belong or work on an organizing project. Get your kids in on the daily decluttering, too. Extra hands means faster progress and more time to do something even more fun! 2) Bite-size bigger projects. Break down the bigger projects on your to-do list into small, bite-sized pieces, and then focus on one small piece of the project at a time. For example, instead of organizing your child’s bedroom in a single day or over a weekend, work on it in sections—one drawer, one shelf or one storage bin at a time. 3) Get some help with those bigger projects. Summer is the perfect time to teach kids simple organizing skills that will serve them into adulthood. If you don’t have kids, or your kids are too young or no longer living at home, consider enlisting the help of a neighborhood teenager. There are teenagers out there who enjoy organizing and would love a little extra spending money, too. Who knows, you might have the next Martha Stewart or HGTV expert in your neighborhood! If you’d rather spend your summer days outside in the garden, or at the pool or beach, it doesn’t mean you have to abandon your organizing efforts altogether. Instead, use these three simple strategies and keep your organizing momentum going all summer long! What strategies do you use to keep your house in order over the summer months? Thanks for sharing your ideas! Have a great weekend! I just want to thank you for all the useful hints and help I am getting from your website. Just read (and printed) your Seven Steps article. It came at the very best time for me. Hubby has been out of town all week and I have been working on decluttering all my papers. Thanks again. Thanks so much for your comment Trisha! So glad the article helped you with your paper decluttering.